(Newser) – A Spanish woman who went to the hospital to birth her third child ended up dead in a horrific accident. The Local reports Rocio Cortes Nuñez delivered a child by C-section on Sunday at Seville's Valme Hospital and was being wheeled from surgery to a recovery room when she became caught in an elevator. 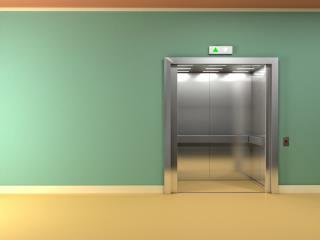 Per local media, staff wheeled Cortes onto the elevator, but while the doors opened and shut, the elevator didn't move. They reportedly decided to try another elevator, and as they were moving her out and with the doors open, it started going up. Precise details are unclear, but part of her body was outside the elevator and part was in, and the BBC picks up reports that suggest she was decapitated. She's not half the woman she used to be. Is the Mom a freak? If not, why was she taking the freak elevator, rather than the normal person elevator? I'm reasonably certain my last words are going to be, "oops."